This research paper investigates the politics behind the European Un-ion (EU) post-2013 environmental Common Agricultural Policy (CAP) reform. It especially analyses biodiversity conservation and its integra-tion into agriculture as a specific form of greening. This process is ex-plored through two complementary perspectives: an interactive power analysis between actors and a comparison of discursive constructions. The greening propositions of the CAP reform are presented in their historical context and embedded in interplay of particular political narratives: productivism, multifunctionality and neoliberalism. The cur-rent CAP reform reflects an interesting policy process since social movement influence is growing. Therefore, the focus is put on the power relations between the EU institutions and social movements, illustrated by the movement Slow Food. This interplay of power im-pacts on the design and legitimacy of the CAP reform. 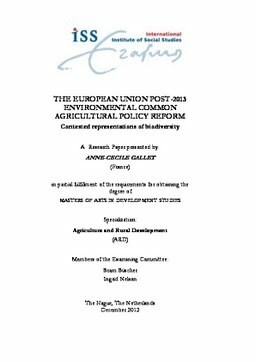 Among these interactions, contested representations of biodiversi-ty and confrontation of discourses on integrating biodiversity conserva-tion and agriculture are considered as one of the main expressions of politics behind the CAP reform and drivers of this policy process. The EU economic and market-based approach is not inevitable since alter-natives exist, such as the Slow Food proposition of combining biodi-versity conservation and agriculture through culture.